There is a show on television called, “Naked and Afraid.” We aren’t positive what the show is about, but from the ads that pop up on our television screen, it looks like “Survivor” without clothes. YIKES! Although most people might laugh at the “new” concept, the first married couple, Adam and Eve, were the original “Naked and Afraid” duo. There it is — the first shift of blame. Adam could have said, “Yep, I did it.” Instead he pointed to Eve. It was her fault, God. As soon as the Lord turned to the woman she said, “the serpent deceived me, so I ate.” The second shift of blame. No one wanted to take responsibility. If we aren’t careful, we fall into the same trap as Adam and Eve. Marriage is vulnerable – we might feel naked and afraid like Adam and Eve. In other words, our spouse sees all our flaws and mistakes — there’s nowhere to hide! So, we have a choice. We can respond like Adam and Eve, and shift the blame at each other – or we can aim for a different outcome and be accountable for our own actions. Accountability means we change the way we think. We focus on OUR OWN actions. We ask ourselves questions like, “What did I do to cause offense?” or “What part did I play that I can apologize for?” Instead of beginning sentences with an accusing “You never … ” we can begin them with a humble “I should have …” It takes practice, but it’s a step towards uniting rather than fighting, resolving rather than dissolving our marriage relationship. Don’t shift the blame, take responsibility for your own actions. Think about the last place of contention with your spouse. What was your part? What could you have done differently? Did you take responsibility? Did you apologize? What can you learn from it? Father, help us to take responsibility for our own actions and mistakes, individually. Help us not to shift the blame, but to be accountable and rise above any tendencies of finger pointing. Unite our marriage. In Jesus’ name, Amen. Because you’re “on the inside” and part of our EXTENDED FRIENDS AND FAMILY … we want to offer you a sneak peek. Over the next year, we will extend the opportunity to connect with us more personally, by offering access to a year long MEMBERSHIP. 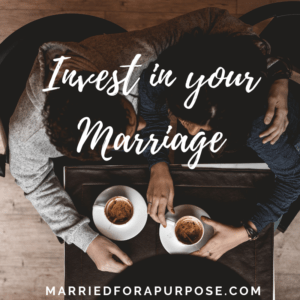 The membership will offer 5 courses designed to help couples THRIVE in Marriage, Discover their Marriage Purpose, and develop New Habits of THINKING to welcome New Habits of Living, for their life and marriage. We will also host 2 LIVE interactive coaching calls, each month, exclusively for our members where they can ask specific questions for growth. We’d love to share more. If you’re interested, take a moment to subscribe below to receive more information about a SPECIAL LIVE call we’ll be hosting later this month.